Stay up to date with us throughout the season & get hooked up with the latest conditions, view our in-season photos & videos, learn some of our great fishing tips and techniques to get you hooked up! 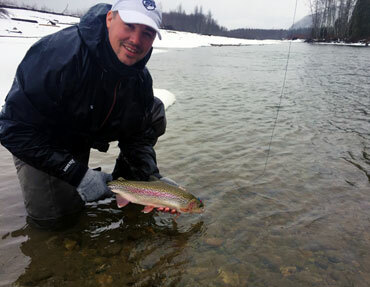 Our early March Kitimat River drift was fantastic with plenty of great fly water to be had this year! 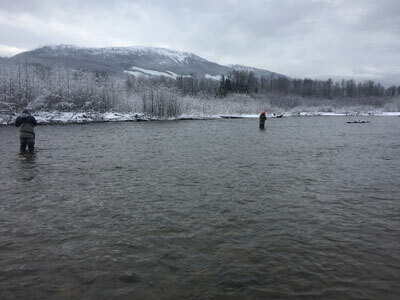 Our newest guide to our team Ryland Findlay spent the day with Todd Haynes drifting the upper to lower river sections scouting out this years sweet spots for both our fly and gear fishers locations. With cold temperatures now over and warmer weather coming our way, the spring Steelhead Season will soon be on! On a cautionary note, the river does have a few sections where the ice build-up is large and rafting portages is needed. No apparent log jams are noted from the washouts down but one is still remaining on the Haisla Bridge to first washout area! Well... with winters chillin arctic freeze still Hangin Around Ha-ha! sounds a bit like the new Eric Church song and I know he's not a big fan of the nasty freezing temps and neither are the spring run Steelhead. Mid March we will be seeing some fresh fish moving in to the rivers and will provide for some great early season hunts! Only a few dates left open for the season so be sure to get in on those last few days for some great prime time steelhead! Our final preparations for the upcoming season are just about complete and ocean boats will be getting some new paint! Vessels are all ready, rods, reels and gear is tuned for our upcoming spring ocean charters. Halibut, Bottom Fish Crabs & Prawns will be on the target list first!